The new ruling by the Department of Labor became law this past June requiring the retirement industry to comply with the covenants by April 10, 2017, with exemptions phasing in through January 1, 2018. The rule drastically changes how financial advice is provided in the United States. It will introduce intense pressure on financial advisors to change the traditional advisory model from commission to fee-based compensation and will substantially change product fees and features. 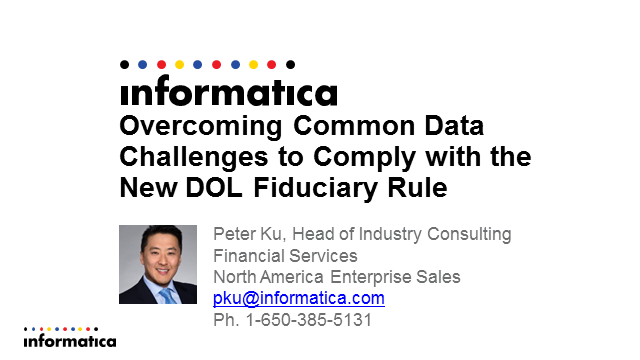 Unfortunately, Retirement Planning, Wealth Management, Insurance companies, 401K companies large and small that look to comply with the new rule will face more scrutiny and reporting requirements that will expose holes in existing data management processes and technologies. Learn what some of these data challenges are, why they exist and why they have been difficult to address, and finally solutions to consider for this requirement and other regulations that require Great Data! Peter Ku, Head of Financial Services Industry Consulting. Presented by: Peter Ku, Head of Financial Services Industry Consulting.